To me, summer is about keeping skin hydrated, protected, smooth and clean. There’s nothing worse than feeling all gross and hot under your makeup, so I tend to streamline my skincare so it keeps my skin in top condition and stops whatever I put on top sliding around and looking terrible. I use a light cleanser on a morning (sometimes double cleansing if I feel a bit urgh), apply a toner to freshen everything up and go in with a hydrating serum. My favourite is Indeed Labs Hydraluron, as it’s not heavy, sinks in in two seconds and makes my moisturiser work so much better. It’s great at keeping the hydrating locked in, which is what I always need with my combination complexion. For moisturiser, I love using Balance Me Balancing Face Moisturiser as it works so well with my skin (ie it doesn’t break me out – hallelujah) and keeps shine at bay on those hot days. For my eye cream, I’ve been using Clinique Even Better Eyes Dark Circle Corrector, as it’s light enough to use both day and night and hydrates the eye area well. I’m big on treatments in summer too, as my skin tends to feel a little congested, especially as I still wear heavy foundations. I exfoliate my skin with the Jurlique Fruit Enzyme Exfoliator, as it works in around 10 minutes to buff away any dead skin cells and reveals a bright and more even looking complexion. I use a clay based mask once or twice a week too, as I like my skin to feel clean! 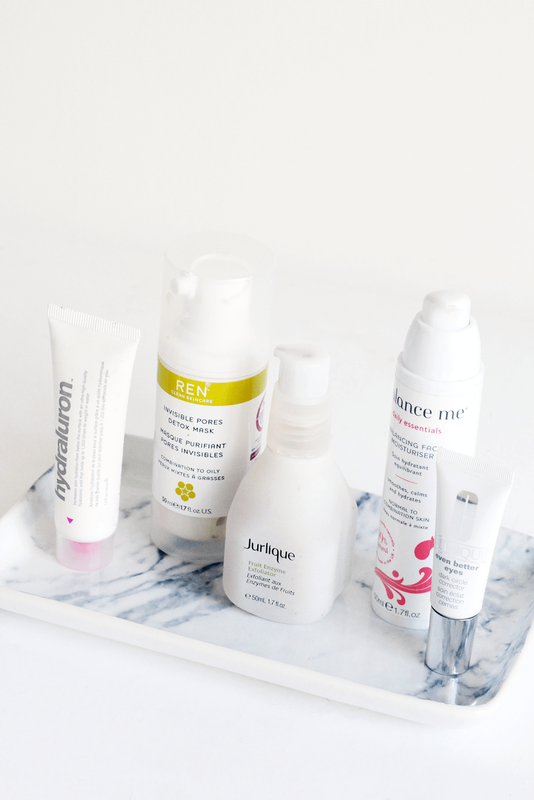 The REN Invisible Pores Detox Mask is one of my most repurchased as it really cleanses pores, reduces congestion and gives skin a bit of a boost! I find this works well when I’m having a break out too, as it tends to reduce redness and heal things a bit quicker. What do you use in Summer to keep your skin happy?